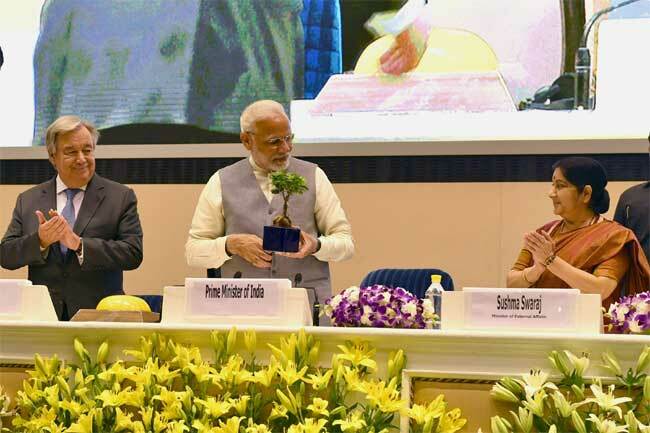 The Prime Minister, Shri Narendra Modi at the inauguration of 1st Assembly of International Solar Alliance (ISA), 2nd IORA Renewable Energy Ministerial Meet & 2nd Global RE-Invest 2018, in New Delhi on October 02, 2018. The Secretary General of the United Nations, Mr. Antonio Guterres and the Union Minister for External Affairs, Smt. Sushma Swaraj are also seen. New Delhi, Oct 3 India wants to create a robust ecosystem for the manufacture of solar panels in the country to give a filip to the sector which can provide opportunities for investments worth $70-80 billion, Prime Minister Narendra Modi said on Tuesday. “We are moving to a future where oil wells will be replaced by the rays of the sun in meeting our energy needs,” he said.